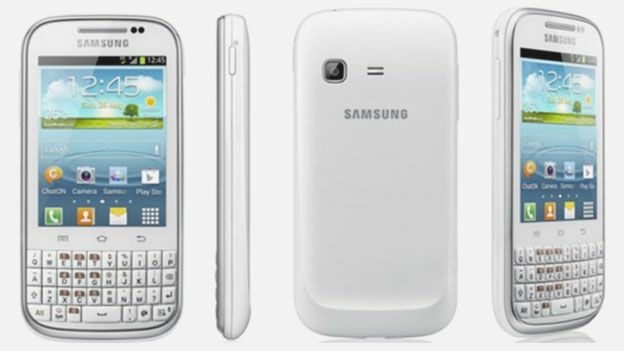 A step away from the market leading Samsung Galaxy S3, Samsung has added to its range of Galaxy branded handsets officially unveiling the full QWERTY touting Samsung Galaxy Chat. Targeting a younger, more entry level market than its S3 sibling, the newly unveiled Samsung Galaxy Chat plays host to an input enhancing physical QWERTY keyboard, an inclusion that will assist in rapid social network updates and instant messages. Lining up at a reasonable 11.7mm thick, the Samsung Galaxy Chat is to offer a selection of entry-level innards with a 2-megapixel rear-mounted camera landing next to a 3-inch QVGA display and Google's Android 4.0 Ice Cream Sandwich operating system. With 4GB of internal storage able to be expanded up to 36GB though a microSD card, integrated Wi-Fi and Bluetooth capabilities handle the handset's connectivity options. A dedicated button also offers instant access to Samsung's BBM-esque ChatON messaging service. Are you impressed by the full QWERTY, messaging nature of the Samsung Galaxy Chat or happier with Sammy's latest touchscreen monsters? Let us know via the T3 Twitter and Facebook feeds.